Left to right, front row: George Axen, Jack Duncan, Bob Magee, Jack Mahood, Ken Jamison, Henry Downer, Marsh Johnson. 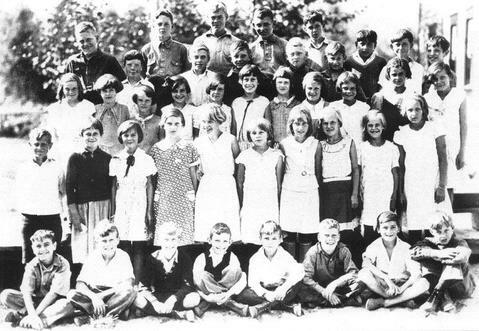 2nd row: Marge Lasser, Josephine Hurren, Violet Sobotka, Angus Hutton, Lillian Lasser, Eileen Mahood, Mary Olsen, Mary Sobotka, Vern Jaimson, Mary Waller. 3rd row: Phyllis Leach, Margaret Hamilton, Nellie Green, Bunny Clarke, Noanie Castle, Lorraine Smith, Connie Prendergast, Laurie McCrae, Betty Quick, Jean Mahood, Ruth Downer. Back row: Allan Cameron (teacher), Albert Lassman, Jed Martin, Sunny Graham, Bill Machin, Ian Hamilton, Jimmy Leach, Jerry Lee (teacher).